Its been a while since I've posted anything here, so here is a quick update. At the moment, I'm injured and unable to run. A workout a little over a month ago stained my piriformis and other than racing the Thetis Relay solo (which aggravated the problem) I haven't really run since. Overall, it is much better now than it was for the first couple of weeks when just walking around was painful, but any running motion pisses it off quite a bit. I've been getting treatment which seems to have helped somewhat, but has yet to fully resolve it. Tomorrow, I'm trying something called Structural Dynamic Therapy which I've had others say has been successful with their injuries. It has been frustrating not being able to run as it is such an important part of my life. Fortunately, I have been able to do other exercise such as cycling, spinning, stair climber, and weights so I have been doing a fair amount of these. I still know that I am losing some fitness and specifically running fitness, but hopefully the loss has been somewhat mitigated. 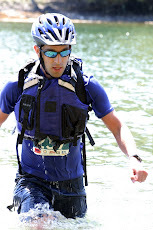 Before my injury I did participate in a few local races and here is a brief summery. 5k Salmon Run Run. A low key charity race taking place at Goldstream Provincial Park that raises funds for environmental education. It was an extremely wet day, but this didn't deter runners and a record number (over 100) showed up for the event. Due to the rain, staying warm was a bit of an issue and I was inching to get moving but first had to get though 10 minutes 'warm up' exercises (I got colder). Eventually we were off looping our way through the campsite roads. A young guy from Shawnigan Lake started out with me, but after a few minutes faded back a bit (he ended up maintaining 2nd). I pushed it pretty hard and felt reasonable doing it. It wasn't a flat course so I knew my time would not be great, but it didn't matter. 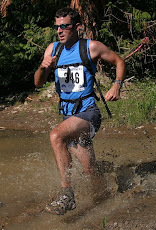 I cruised to the finish crossing with a completely soaked shirt in 16:33. Nothing spectacular, but decent enough considering that I hadn't done as much speed work over the summer. 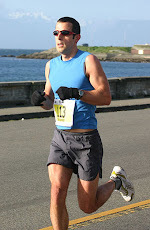 MEC Victoria Fall Classic 10k. Another low key event paired with a 5k. I think these events are great since the low frills nature (no shirt, basic food, etc.) keep the cost low. For many avid racers such as myself, how many shirts do you really need? I have never liked races that include a shirt with no op-out option. Anyway, the race was a out and back on the Galloping Goose starting near Johnson St Bridge with a loop around Swan Lake at the for the turn around. 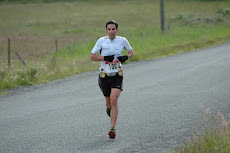 I started out a bit too hard doing about 3:20s for the first couple of kilometres and had to ease back a bit to avoid a poor finish. No one challenged me for the lead so it was really just a race against myself. The trail around Swan Lake certainly slowed things down, but after that, I managed to pick it back up a bit. My finishing time of 35:32 was quite slow for me, but I was still happy to get a solid run in. Overall a well run event, but I wish these low key events would get the placement of the kilometre markers down properly. They don't need to be exact, but with inexpensive GPS technology available to anyone with a smart phone or a running or biking GPS there doesn't seem to be a good excuse to not have them fairly close to where they should be. Some of the markers for this race were over 100m off. I'm sure that the organizers will get the hang of it on some future events though - next year I understand 3 are being planned.